"The Logic of Insurgent Electoral Violence"
w/ Luke Condra, James Long, & Austin Wright. Daily counts of indirect fire attacks through the Afghanistan War. Vertical dotted lines indicate election days. "Information and Communication Technologies, Wartime Informing, and Consequences for Substate Conflict"
Invited for revision by the International Studies Quarterly. Calls by type placed to a "tips"hotline operated by British forces in southern Iraq during the Iraq War. I explore the relationship between wartime informing by civilians, information and communication technologies (ICT), and the production of violence by insurgents. I theorize that the effect of ICT-facilitated informing on wartime violence depends upon the degree of organizational planning and, separately, weapons-use constraints associated with insurgent attacks. Newly declassified data on calls--both false and legitimate--placed to a "tips" telephone hotline operated by British forces in Iraq's Basra region during the recent Iraq war reveal that insurgents' efforts to overwhelm the platform were extensive--on some days, roughly 1,200 false calls were received for every ve legitimate tips provided by informants. Nevertheless, intelligence received through the line appears to have led to reductions in the most organized forms of insurgent violence as well as attacks with weaponry that were most likely to be drawn from caches before their use. Intelligence is also associated with significant increases in direct fire attacks, which may reflect substitution by insurgents into less well coordinated, and likely less effectiove, forms of attack. w/ Francesco Trebbi, Eric Weese & Austin Wright. We study insurgent learning during a counterinsurgency campaign. 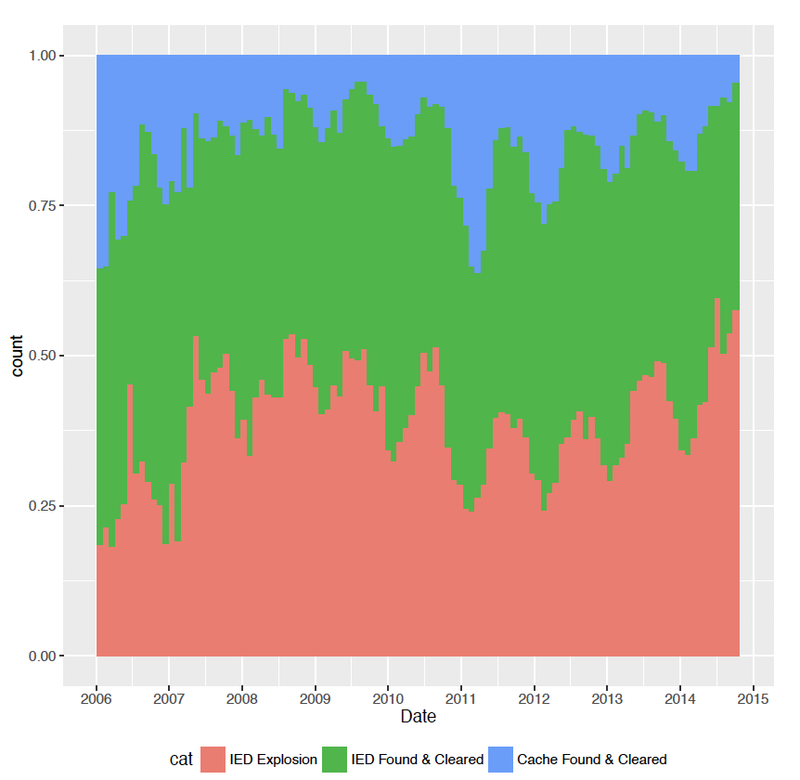 We examine adaptation to counterinsurgent defeat technologies using newly declassified microdata documenting improvised explosive devices (IEDs) in Afghanistan from 2006 to 2014. This period was characterized by substantial US investments in anti-IED technology and equipment. We find no evidence of decreasing effectiveness of IEDs across time. Qualitative evidence from a number of conflicts suggests that this is due to innovations in IED devices and tactics. Our results are robust to numerous alternative specifications, and yield insights on a technological revolution in insurgent violence--the proliferation and evolution of IEDs--with implications for scholarship on political violence. Substate conflict is the source tremendous human suffering and financial burden worldwide. Research recently published in Science claims to have uncovered predictable patterns in insurgent and terrorist attacks: like various unrelated physical phenomena, the rate of learning by insurgents (and thus rate of conflict escalation) follows a predictable power law process. Governments afflicted by insurgent violence might use such patterns to thwart some attacks. The authors do not, however, consider strategic interaction during conflict and derive their results using data that recent research indicates is likely biased. Using newly declassified, comprehensive, and methodically collected data on insurgent activities covering all years of the Afghanistan and Iraq wars supplied by the Pentagon, we demonstrate that these findings are an artifact of biased microdata. We further show that dynamic learning during conflict varies continually: at times, insurgents learn more quickly than their opponents; at others, they do not. Observable patterns of learning by insurgents in conflict environments are complex and reflect strategic imperatives. The results speak to the need for greater interdisciplinary collaboration. Parsimonious mathematical models used to describe physical phenomena are not clearly suited to modeling strategic political in- teractions. If physical or social scientists are to inform national security policies, they will likely need to do so collaboratively.